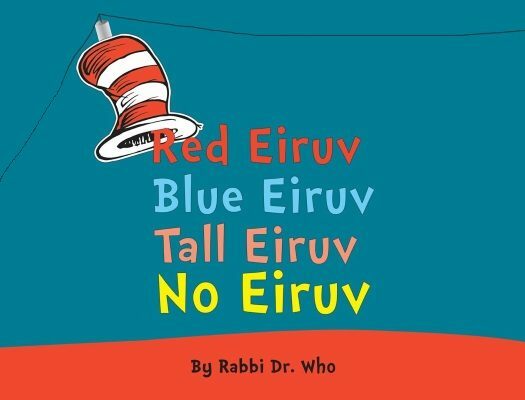 A tense religious dispute between Orthodox Jews in Crown Heights over a new eruv is now getting it’s first literary treatment — as a Dr. Seuss-style poem. “Red eruv, blue eruv, tall, eruv, no eruv,” the poem is called, penned by “Rabbi Dr. Who,” and is largely a call for peace. The 14-stanza illustrated poem is a creation of two Crown Heights Lubavitchers, Moshe Kravitsky, the writer, and Shmuli Evers, the illustrator. It amounts to a literary commentary on the still-brewing controversy around a disputed ritual boundary in the neighborhood. Eruvs are wires that allow Orthodox Jews to carry goods on the Sabbath. 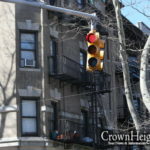 The one in Crown Heights is controversial because Modern Orthodox Jews created it but many Lubavitcher rabbis oppose it. Click here to continue reading at The Forward. to paskan on OUR neighborhood? Artwork design by the masterful Shmuli Evers. 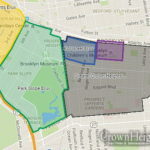 Crown Heights Eruv Is Up! When Moshiach will come today? Because Moshiach is nearer and nearer. This is manis friedman kfira. I think it’s pathetic that you make R Manis Friedman your enemy. Really? What about the Baal Shem Tov’s interpretation of ואתה קדוש יושב תהלות ישראל? The boys should sing it in the street. Even Bilam said it clear. Do you need to carry here? For that will cause a big delay. No. Please don’t carry. No way no how. I really want Moshiach now. Tear down this eruv immediately! Why should they have to show their might???? What will be left for our kids? Old tales of days that are now hid? I haven’t been to crown heights in many a year. However, I feel, that I too, must make a stir. All comments on eruv must be in rhyme! Very cute! Nice to see some the energy generated by this put into a creative and positive direction! We don’t want to wait! ehem u guys all close your mouths! The chabad light wants the eiruv but guess what?! You aint gonna get it! Moshe Kravitzky we the “normal” chabad groups luv it! Keep on going! Was the Eruv ok this shabbos? Why don’t you all spare us the time? Quit being babies and wasting our time. Moshiach will only come when we get along. Love your fellow lubavitchers from your local, as much as you love, the karkaftas abroad. Because from here on in, I won’t give a darn. because I stepped on a big fat mouse. who got paid for what he did. Is this book in print yet? Where can I get it? !